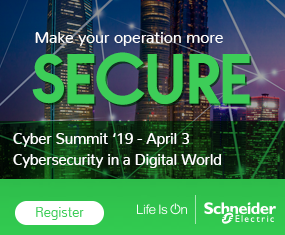 In this environment where cybersecurity awareness is through the roof, but confusion sometimes reins when starting to implement a plan or program, Schneider Electric created a website that can help address those issues and more. Schneider Electric’s new Cybersecurity Virtual Academy is a website that provides educational cybersecurity content and is a platform for ongoing interaction through live webinars, chats with experts, downloaded material, videos, and ongoing Q & A. •	Learn from and interact with others to share ideas. The first webinar to be hosted through the Cybersecurity Virtual Academy occurred April 5 – “Cybersecurity – the time is NOW!” featuring a panel discussion between Eric Cosman of ARC Advisory Group, ISA and formerly Dow Chemicals, Gregory Hale, Editor/Founder of ISSSource, and Joshua Carlson from Schneider. Those interested in viewing the on demand version of the webcast can click here to register. Click here to register for the Virtual Academy.